Bring a show stopper to your perfect day! Another one of our large cakes The Hardwick is created using 6 delectable cheeses to suit all tastes. Serves 150 - 170 guests comfortably. 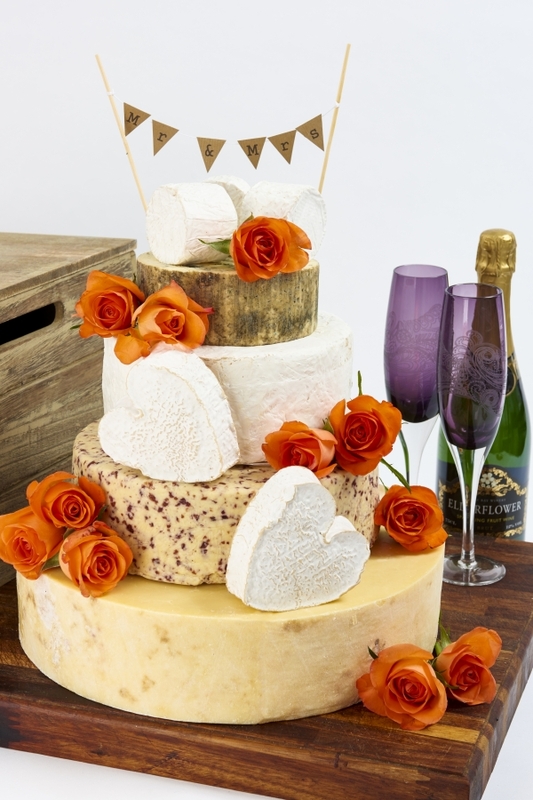 Along with every wedding cake we send out from our 'Set Range' we will send a postcard with a photo of the cake and on the reverse there will be full descriptions of each of the cheeses you will be serving to your guests. Please Note: The wedding cake comes undecorated for you to stack and decorate as you wish. Look at our website gallery for some examples. If you would prefer to taste before you buy you can purchase a sample box of all the cheeses that go to make up The Hardwick Celebration Cheese Cake. Additionally we can supply the perfect biscuits and/or chutneys to accompany your choice of cake - these are packaged in the correct quantities for the cake you have chosen and priced as below. If you are ordering the full celebration cake please ensure that at checkout you enter the date you want your cake to be DELIVERED TO your venue and ensure that the delivery address you choose is where you want us to deliver your cake. We need your order at least two weeks in advance of your event. Obviously for a sample box we will deliver your order as soon as possible.